Maple Anglican | Anglican Vlogger, Educator, Father, Sinner, Christian. Advocate for Social Media Evangelism and Anglican Evangelism in the 21st Century. Earlier this month Archbishop Fred Hiltz, Primate of the Anglican Church of Canada, announced his intention to resign on 16 July, 2019 which will be the last day of the 42nd General Synod. ++Fred was originally elected to the position in 2007. I may or may not make a video on all this later on, but here it goes. What is the Primate of the Anglican Church of Canada? Canada” and its “Senior Metropolitan”, as well as being the “Chief Executive Officer of the General Synod”. What does that mean? Effectively, the Primate is responsible for overseeing the functioning of the Church as a whole, represents the Church as a whole, gives pastoral support to the rest of the Bishops of the Church in Canada. However, unlike most other Churches in the Anglican Communion the Primate does not have a see as they must resign it within 90 days of being elected Primate in a similar matter to the Presiding Bishop of the Episcopal Church in the United States. Even thought the Primate has no Diocese nor a Province to oversee he (or she) is still considered a Metropolitan. Who is the current Primate? The Most Reverend Fred Hiltz is the current Primate, having been elected to the position in 2007. Before becoming Primate he was the Bishop of Nova Scotia and Prince Edward Island. Is there a massive scandal or something? No. Not even close. Essentially, he wants to retire and hand over the reigns crosier to someone else. While ++Fred can serve until he turns 70 he will be 65 (which is the nominal retirement age here in Canada) during General Synod in 2019. How will the new Primate be Elected? The Canons, specifically Canon III Part II, require that the Primate is elected by General Synod. Between 30 and 100 days before General Synod all the Bishops of the Anglican Church of Canada will gather together and nominate three or more Bishops. Any Bishop of the Anglican Church of Canada can be nominated: Diocesan or Suffragan. 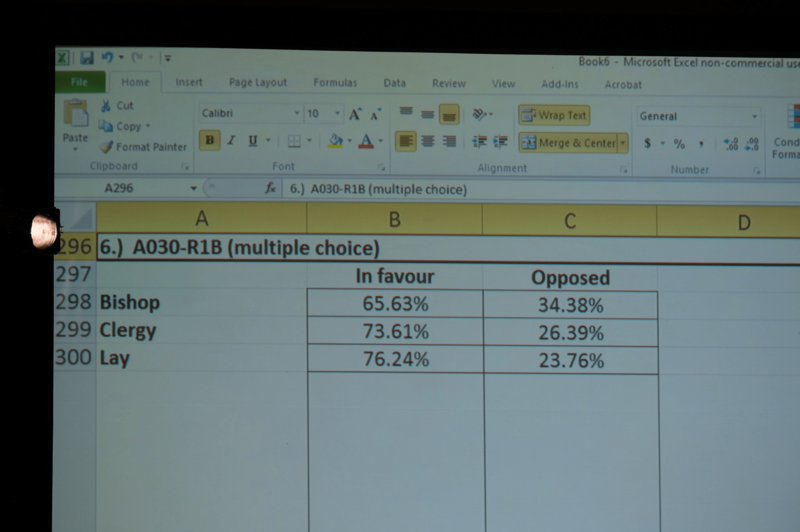 After the Bishops have “withdrawn” from the remaining Clergy and Lay members of General Synod the two Orders will vote on the nominations which follows a process in which the nominees will proceed through a number of ballots, seeing nominees dropped (if required) until just two remain and/or a nominee has reached a majority of votes in both Orders. If there is an impasse they can request new nominees from the Bishops and continue the process, or the Bishops can vote on the final two nominees in order to break the impasse. From my reading of the Canon if the Clergy and Laity elect someone the Bishops don’t have to confirm, nor can they veto. Who is going to run? Alright, that would be massive, massive speculation at this time. As of my writing of this there are 37 Bishops I am aware of who are eligible. However, Archbishop Colin Johnson of Toronto, Bishop Michael Bird of Niagara, and Bishop Don Phillips of Rupert’s Land have all announced their retirements. At the same time it is possible that their replacements could nominated for Primate. This blog post is about the future of the ministry that is Maple Anglican. Before you think “Oh, no! MA is going to shut down.” Please, be calm. For the past few years that amount of content I have produced has reduced quite a lot. There have been far fewer videos, fewer blog posts, and alas even far fewer memes. There are some reasons for that and now that I feel comfortable enough to share and begin a discussion about the future of this ministry. This will not come as a surprise for many, however, for a few years now I have been discerning the call to ministry, and I made this more formal in April of 2016 when I began a Master of Theological Studies degree online. Thus, a lot of my time online has been devoted to course work. I just finished up two courses earlier this week and I have nothing on my plate there until September. As well, four years ago I was promoted in my company to do a very wonderful career in Information Security which takes up a lot more of my time but it much more rewarding. Finally, I have been coming to grips with the fact that I suffer from depression, that is largely caused by me not treating my Attention Deficit Hyperactivity Disorder (ADHD) since I began University in 1998. I would have occasional bouts of depression since starting University, however, the coping mechanisms I used since then stopped working, and my ADHD driven brain which was unable to deal with the world putting me into depression. I am currently medicated for the Depression while getting my ADHD under control, however, the later has been a bit of a challenge as some of you will recall I was in the ER during June. When I first began this ministry the purpose was to use social media as an medium much like the way books were used with regards to the Protestant Reformation. However, since starting this I have come to realize that social media has come to become a very nasty place, full of much vitriol and hatred as can easily be seen in the US political scene. I really don’t want to give this up. I have about two months to do some work here and trying to pan some things out, however, I need a bit of a muse. Which is why I reach out to you as ask you what should I do? Is there a video or two I should try and do during the summer? Should I try and re-boot this Ministry, reveal who I am, make this a bit more personal? Thus, my brothers and sisters in Christ, I prayfully look for your input. Today is May Day, sometimes known as International Workers’ Day, which is can be a bit of a big deal in the Labo(u)r movement. But today in the Church is also the Feast of the Apostles St. Philip and St. James … unless you are Roman Catholic in which case the more modern Feast of St. Joseph the Worker. And for (Neo-)Pagans yesterday, 30 April, was also a Feast known in some circles as Beltaine. This might come as a shock to a few people but for a time I “flirted” with (Neo-)Paganism. In fact, when I originally enrolled in the Canadian Forces in 2004 I explicitly said I was one, and to this day there are people I still call good friends that I had meet in the (Neo-)Pagan Community of Edmonton. Because of this “flirtation” with (Neo-)Paganism I ended up not only coming back to Christianity more historically and liturgically minded but also with an better understanding of the importance of a yearly cycle of festivals. Depending on what particular flavour of (Neo-)Pagans you run into there are claims that certain Christian feasts, or even traditions surrounding said feasts, were solden/borrowed from ancient Pagan rituals. Now, some of that is true and some of that is historically false. Neo-Paganism (notice I didn’t include the brackets there) generally highlights a series of festivals called Sabbats that are linked with the year, hence the collective name given to them called The Wheel of the Year. (There are also a series linked with the Moon called Esbats) There are 8 such festivals with four being major, and four being minor. And, they do match up with some festivals on the western Christian Calendar. See table below, and be aware there are a lot of missing asterisks. At first glance you might think “Wow! Christians might have stolen a lot of dates from Pagans.” but that can be a bit deceiving. Generally, (Neo-)Pagans consider the cross-quarter days to have a bigger significance than the quarter days (Solstices and Equinoxes), and I seriously doubt any Christian would view the Feasts of the Presentation (Candlemas), Ss Philip and James, the Transfiguration and All Saints’ Day being more important than Christmas, the Annunciation, or St. John the Baptist. At the same time some of the points they have about Pagan traditions making there way into Christian ones does have some validity. For example, the decoration of eggs from Ostara, that is the celebration of the Spring Equinox, however that gets used at Easter and not the Annunciation. Others, like the claims that May Poles were used by Pagans in the British Isles for Beltaine and continue to be used in those nations by Christians has merit, but if you know anything about Beltaine it’s a vastly different feast than one for two Apostles. On top of all that there are other Christian feasts that aren’t on the previous table that don’t have a matching (Neo-)Pagan feast with the same or similar date. This includes Ss Peter and Paul on 29 June, St. Michael and All Angels on 29 September, and the Epiphany on 6 January. With regards to “Cultural appropriatation” I think it is important that Christians recognize that when the Gospel is genuinely spread to another people the whole of their culture does not disappear. This is clearly shown in the peoples of the British Isles, the First Nations in North America, and the peoples of Africa. Heck, if you look at the two other major religions that cross ethnic boundaries (Islam and Buddhism) you can see this as well. In closing, I would like to point out that we are now coming to live in a #FakeNews era. Social Media has a way of spreading around a lot of falsehoods with regards to not just what a Presidential candidate said or the list of people who mysteriously died with a connection to them, but also were falsehoods with regards to religion, tradition, and historical facts occur. Because of this it is always healthy to double check what you see online. And, yes, that means this blog post too. Today, 6 January, is the Feast of the Epiphany, the day that ends Christmastide. The Epiphany is one of those parts of the Christian Faith that in our modern world has lost its relevance and meaning… which pisses me off. The importance of what is happening with this also comes in the traditional alternative name for the Epiphany that we find in the Book of Common Prayer: Manifestation of Christ to the Gentiles. The Epiphany is about salvation, specifically the salvation of the Gentiles. Epiphany is about salvation now being extended to Gentiles, those persons who were previously not part of God’s chosen people. The Traditional Epistle reading for this feast comes from Chapter 3 of Saint Paul’s Letter to the Ephesians. St. Paul (someone born and raised as a Jew, but outside of the Holy Land) speaks about the importance of the Gospel being able to be spread among all nations, and that the promise of salvation is available to all. O GOD, who by the leading of a star didst manifest thy only-begotten Son to the Gentiles: Mercifully grant, that we, which know thee now by faith, may after this life have the fruition of thy glorious Godhead; through Jesus Christ our Lord. Amen. and not just the descendants of Abraham who were God’s original chosen people. I could go on ad nauseam citing the New Testament on this with point but the New Testament is full of examples of people who were born and raised Jews, believing that they were God’s only chosen people because of their bloodline going back to Abraham, suddenly going out and spreading the Word of God to non-Jews. Oh, FFS! One vote! One Bloody vote! Firstly, I’m not referring to the horribly bungled experience with the non-passing/passing/reconsideration/re-count debacle that was Resolution A051-R2. That, in my view, has resulted in a lot of unnecessary pain and heartbreak for people on both sides of whether to allow Same-gender marriages to occur under Canon Law. The 1962 Book of Common Prayer remains the de jure source of prayers. Based on the principal of Lex orandi, lex credendi that prayer is still an official doctrinal profession in the Anglican Church of Canada. As I noted in a previous entry we really do need a new BCP, but doing so is incredibly difficult. In fact, as the vote today proved even altering the BCP is frigging difficult. O MERCIFUL God, who hast made all men, and hatest nothing that thou has made, nor wouldest the death of a sinner, but rather the he should be converted and live: Have mercy upon the Jews, thine ancient people, upon all who reject and deny thy Son; take them from all ignorance, hardness of heart, and contempt of thy word; and so fetch them home, blessed Lord, to thy fold, that they may be made one flock under one shepherd, Jesus Christ our Lord; who liveth and reigneth with thee and the Holy Spirit, one God, world without end. Amen. It is super-obvious that the two prayers are very similar in composition and purpose. Now, I will admit that I delve into supporting some Supersessionism to support positions to such things as the Sacraments of Baptism and the Eucharist from time to time, however, I recognize that prayers like this can seem incredibly insensitive in today’s world. For that reason, either the prayer needs to be revised or the prayer needs to go. That brings us to a simple resolution that was called Housekeeping Amendments in the handbook for General Synod. Constitutional, Canonical, and Prayer Book revision requires a two-thirds majority in all three Houses of General Synod: The Laity, The Clergy, and the Bishops. Thus, in order to remove the offending prayer it would have had to pass First Reading at the 41st General Synod in 2016, and then passed Second Reading at the 42nd General Synod in 2019 in order to be enacted in 2020. As you can see, the resolution succeeded in the Houses of Clergy and Laity, but failed with the bishops. The result(s) of the Marriage Canon vote, the negative/positive press that has come with it, and the bitterness that has accompanied people who were on both sides of the issue while massively overshadow this failure to remove the offending prayer. While there is good cause that it should overshadow the vastly minor attempt at BCP revision the very fact that we couldn’t get such as simple, super-obvious revision done to the BCP pains me greatly. It shows that the Canadian Church is dysfunctional. If anyone is thinking: “Please, Maple, don’t leave Anglicanism/the Anglican Church of Canada/the Anglican Communion” don’t worry; I am here to stay. You can’t get rid of me that easily. The major lesson we are talking away from General Synod this year is that one vote matters. And while those who support Same-Gender Marriages come away at the end rejoicing that we are on the road to making these Marriages a reality we are also coming away having damaged not only our internal relations with one another but also our relations with the Jewish Community. Because at the end of the day General Synod just said it is still our belief to pray that God will take away the hardness of hearts of the Jews. Christian Zionism is False. There, I said it. Now, let’s be fair to the interviewees that is a short video, and we only get small tidbits of the reaction from the persons being interviewed. However, we do get a sense that some of the interviewees are holding to their position on the JCPOA because they think it is bad for Israel and then suggest their support for the modern nation of Israel is required of Christians. This concept is part of something bigger called Christian Zionism. Christian Zionism is (I’m doing the horrible thing of quoting Wikipedia) “is a belief among some Christians that the return of the Jews to the Holy Land, and the establishment of the State of Israel in 1948, is in accordance with Biblical prophecy. The term began to be used in the mid-20th century, superseding Christian Restorationism.” It is massively problematic beyond Christians have nearly blind support for the State of Israel. This modern idea began with English and Scottish clergy but it is much more identifiable with North American Christianity particularly with Evangelical Christians. Firstly, the modern State of Israel is not spoken of in the Bible any more than the modern Arab Republic of Egypt is spoken of in the Bible. Secondly, we have to remember that the creation of the modern State of Israel rests on the formal end of the British Mandate in Palestine, the Israeli Declaration of Independence on 14 May 1948 and the UN General Assembly Resolution 181 which was suppose to carve up the mandate into three areas: a Jewish area, an Arab one, and the City of Jerusalem to be under a “Special International Regime”. The modern State of Israel should in no way be viewed as a legal continuation of the Roman Province of Iudaea nor any other political division that was jurisdiction for the Jewish people. And while I point out this blog post does not speak to Israel’s right to exist I will point out that the State of Israel’s right of existence does not come from Scripture, more importantly not from the New Testament. The passage in Genesis that is quoted deals with the offspring of Abraham through his son Isaac and deals with the Old Covenant. However, the Old Covenant has been replaced by the New Covenant revealed to us through the Incarnation, Birth, Baptism, Ministry, Passion, Burial, Resurrection and Ascension of Our Lord, God and Saviour Jesus Christ. In Galatians 3 Saint Paul wrote “those who believe are the descendants of Abraham.” If this is extended to Genesis 17 then this not mean that we Christians have a claim to the land promised to Abraham’s descendants? When it is said that “Our Messiah and King, Jesus Christ, was born of Jewish parents, into a Jewish society, thus making the Jewish people our ‘royal family'” are we not ignoring what Saint Peter said of us, the Christian people, his First Letter when he said “But you are a chosen race, a royal priesthood, a holy nation, God’s own people, in order that you may proclaim the mighty acts of him who called you out of darkness into his marvellous light.” he also points out that Jews (unlike those like Saint Paul and himself) who rejected Christ had rejected the cornerstone (1 Peter 2:7; Psalm 118:22). In fact, if one reads Saints Peter and Paul close enough one has to come to accept that they believed the Jews of their day had lost their status of being God’s chosen people and that status came to lie exclusively with those in the Church. If there are Christians among us that are wanting to hold to a view that the Covenant given to Abraham was not transformed into the New Covenant of the Gospel then we have to be willing to point out that their Theological position is one of a selective interruption of Scripture that involves ignorance of a large portion of the New Testament because the New Testament is very clear that Christians have become God’s chosen people: the new Israel. The Circumcision of the Old Covenant has been replaced with the Baptism of the New Covenant, the Passover meal has been replaced by the Eucharist, and the Law of Moses has been fulfilled. Christian Zionism must be rejected as False Doctrine. This goes beyond what anyone thinks about the right of existence of, and the actions of the modern State of Israel. Given the Apostles writings in the New Testament it is scandalous to accept that both Christians and Jews can simultaneously be God’s chosen people. That should in no way be a reflection that Jews should be the target of ridicule, bigotry or hatred for they (like any non-Christians) are still Children of God and made in his Image. Nor does it mean that it is acceptable to target the State of Israel with violence or hatred. But we as Christians must be prepared to point out that Christian Zionism is False Doctrine, Heretical, and a horrible reason for which to base foreign policy and political decisions. In 2001 the Anglican Church of Canada and the Evangelical Lutheran Church in Canada reached an accord officially named Called to Full Communion but is better known as the Waterloo Declaration. The accord established a relationship of Full Communion between the two Churches in which the validity of the Sacraments and Ordained Ministers of each Church were recognized, among other things. This was the result of discussions between Anglicans and Lutherans going back decades worldwide. The Waterloo Declaration is one of several Full Communion agreements between Churches of the Anglican Communion and Churches of the Lutheran World Federation, the most noteworthy being the Provoo Communion Statement of 1992 which established inter-Communion between Six Anglican and Seven Lutheran Churches. It is no secret that I am a proud Anglican. I also have made it no secret that I consider myself a Nordic Canadian with ancestry from Denmark, Norway, Sweden along with Volga German and Lowland Scots. Thus, for me the fact I am in Full Communion with fellow Nordic and German Canadians is really cool, and I have proudly exercised Full Communion by receiving the Sacrament of the Holy Eucharist from a Lutheran Pastor (and Bishop) twice. Earlier this month I had the pleasure of dropping in on the National Convention of the Evangelical Lutheran Church in Canada here in Edmonton, notably to have a beer with the Rev. Erik Parker, host of the blog The Millennial Pastor. While I was enjoying my Keith’s IPA Erik had told me about a motion to be debated the next day that might “Test Waterloo”. That motion (which passed) started hitting the Anglican blogosphere yesterday in part due to the Anglican Journal’s story entitled ELCIC approves lay communion presiders and preachers, and the reaction has been primarily negative and for good reason. Now, if you are not an Anglican you might be thinking “I don’t see the problem”, and if you are Anglican (or Catholic, or Orthodox) you might be thinking “Whaaaaaaaaaaaaat!?!?!”. The reason for this motion is that some isolated Lutheran Congregations do not have a Pastor, nor an Anglican Priest or some other Ordained Minister that can fulfill the need to preside over the Eucharist for them. Most Anglican Parishes celebrate the Eucharist weekly, or bi-weekly at worst. The frequency for Lutheran parishes is less than the frequency for Anglican Parishes. However, for many Lutherans it is difficult to get an Ordained Minister to Preside over a service of the Eucharist monthly. Anglican and Lutheran Theology differ on a number of issues, not least of which is the nature of Ordained Minister which even Anglicans will debate among themselves. Lutheran Theology is very much confessional (What do our Confessions say), while Anglican Theology is very much Liturgical (The Law of Prayer is the Law of Belief). For example in the Augsburg Confession the early Lutherans stated that “no one should publicly teach in the Church or administer the Sacraments unless he be regularly called.” (Article XIV, Augsburg Confession) while the closest thing in Anglicanism would be from Article XXIII of the Articles of Religion. However, Anglican liturgical resources such as the Books of Common Prayer are quite clear that only Priests (or Bishops) can preside over the Eucharist. The only jurisdiction in the Anglican Communion willing to contemplate otherwise is the Anglican Diocese of Sydney in Australia. With the recent change to practice within the Evangelical Lutheran Church in Canada does present a question: Can the Anglican Church of Canada continue to be in Full Communion with the Evangelical Lutheran Church in Canada, and does this action violate the Waterloo Declaration. I am going to answer with a definite Yes, and No. But, Maple, you attend an Anglo-Catholic Parish and are a stuck up guy on rubrics and liturgy. Yes, I do presently attend an Anglo-Catholic Parish, and I can be a bit of a rubrics snob but I am knowledgeable enough to understand what is going on. Firstly, if you take the time to read the Waterloo Declaration you will notice that while the validity of the Ordained Ministers of each Church is recognized and the encouragement of members of either Church to communicate in the other Church the document does not indicate the necessity of an Ordained Minister to Preside at the Eucharist. Full communion is understood as a relationship between two distinct churches or communions in which each maintains its own autonomy while recognizing the catholicity and apostolicity of the other, and believing the other to hold the essentials of the Christian faith. In such a relationship, communicant members of each church would be able freely to communicate at the altar of the other, and there would be freedom of ordained ministers to officiate sacramentally in either church. Specifically, in our context, we understand this to include transferability of members; mutual recognition and interchangeability of ministries; freedom to use each other’s liturgies; freedom to participate in each other’s ordinations and installations of clergy, including bishops; and structures for consultation to express, strengthen, and enable our common life, witness, and service, to the glory of God and the salvation of the world. So, the Waterloo Declaration does not force the Anglican Church of Canada to recognize the validity of a service of the Eucharist which was presided over by an authorized lay minister. If an Anglican would find themselves at a Lutheran Parish and such a lay minister was to preside nothing requires them to receive the sacrament in order to keep up the appearances of Full Communion. Secondly, while the Waterloo Declaration would put the Anglican Church of Canada in the position of being in “mutual recognition and interchangeability of ministries” with the Evangelical Church of Canada this in no way would require us to allow such lay ministers to preside over the Eucharist in one of our own services. They would effectively be the equivalent of Lay Readers in our Church. Thirdly, and I am not going to lie, this act by the Evangelical Lutheran Church in Canada might represent a threat to continued Full Communion depending on where this action takes the theology of the Lutherans. I could speculate for a number of paragraphs, however, the best thing to say is that this very well could create a problem in the future. The Waterloo Declaration, and the path that brought both Churches there, forced both Churches to examine their own beliefs and doctrine, along with having to make some changes within their Churches to make Full Communion work. By far it was the Lutherans that had to accept more compromise then the Anglicans have. If there are persons among us in the Anglican Church of Canada who believe that this change by the Evangelical Lutheran Church in Canada is important enough to end our Full Communion then they have the ability to voice that concern at General Synod next year in Toronto. However, this change for a very small amount of Lutheran Parishes is unlikely to affect any Anglicans or Anglican Parishes. If it did then I would say there is more cause for concern. So, my fellow Anglicans (especially all my High Church friends): let’s calm down, take a deep breath, and relax. It is best to wait and see what develops. The only way this is going to affect you is if you show up at a Lutheran Parish in a rural community and you see someone wearing an Alb but no stole trying to preside at the Altar. If you happen to see it happening just don’t take Communion and be polite. If something else develops in the next decade or so we can politely withdraw from Full Communion, but until then this isn’t that bad. The 78th General Convention of the Episcopal Church is currently going on in Salt Lake City. One of Resolutions being considered was C010 “Invite All to Holy Communion”. The Resolution had the purpose of forming a task force to look at allowing all persons to receive the Sacrament of the Eucharist, also known as Holy Communion. The Resolution originated in the House of Bishops and was defeated 79-77. When I first started attending Anglican services in 2008 I was just coming out of being an Apostate for some 5 years. (There you go: you know one of my dreaded secrets.) Thus, before I took Holy Communion for the first time in an Anglican Parish I checked to confirm I could out of respect for the Parish. (At the time I didn’t know I would be staying. Ta da!!!) Thus, my being baptized and raised a Christian enabled me access to Holy Communion some 5 years after I had left the Church. And while I greatly appreciated the fact that I could, and that I did commune that Second Sunday after Easter in 2008 (yes, I remember the date) I can tell you I would have very likely come back the next Sunday had I not taken Communion. However when it comes down to it there are some major issues with Communion without Baptism (CWOB). The first, and very obvious reason, is that it simply not been part of the Christian tradition as the standard practice of the Church. Heck, if we want to get technical the Catechumens, that is people seeking baptism (hence unbaptized) got kicked out of the Church and didn’t get to witness or be present at the consecration of the Bread and Wine into the Body and Blood of Christ. However, one could easily and honestly retort that Tradition on its own isn’t enough and that things change. Okay, I will give them that… but this is a rather important tradition. Whoever, therefore, eats the bread or drinks the cup of the Lord in an unworthy manner will be answerable for the body and blood of the Lord. Examine yourselves, and only then eat of the bread and drink of the cup. For all who eat and drink without discerning the body, eat and drink judgement against themselves. If someone has little to no experience of the Christian faith how can we expect them to be answerable for the body and blood of the Lord? How can we put that on someone? I mean, we can barely put that on ourselves. Matthew 28:19-20 which states Christ’s Great Commission to spread the Gospel, but also importantly to Baptize. Romans 6:3-11 in which St. Paul links our Baptism to Christ’s Death, Burial and Resurrection. 1 Peter 3.18-22 which states that Baptism “now saves you”. 1 Corinthians 12.12-13 which states that being Baptized makes one part of the mystical Body of Christ a.k.a. the Church, and therefore Christians. It is very apparent that Scripture tells us that Christ told us to Baptize people abd that it was key to our salvation, and that the Apostles said it saved us, and that it made us Christians. It is also very likely the Circumcision of the New Covenant as in the Old Covenant the act of Circumcising a male made him Jewish. So, if we were to postulate and hold that the Eucharist is the Passover of the New Covenant, then those uncircumcised according to the New Covenant (the unbaptized) are to be excluded. I will admit that my analysis can seem cold and harsh but the truth is that the Christian doctrines surrounding the receiving of the Eucharist to the Baptized in good standing has an incredibly strong foundation in Scripture and Tradition. The Didache (which is not part of our Canon as Anglicans but is still an excellent reference) states in Chapter 9 that only those baptized can Commune. It is from the 1st or 2nd Century AD. The Apostolic Constitutions (Book VIII, Chapter XXXV) also states that the unbaptized are not to receive. It also states that if such a person has to instruct him and baptize him quickly. The Constitutions are argued to be from the late 4th Century AD. Heck, it was not until the mid-20th Century that in Anglicanism that a unconfirmed person would receive the Eucharist. I do not, in the least, want to seem disparaging to my brothers and sisters in Christ who honestly think that the Church is being unwelcoming to the unbaptized. However, we have good case not to admit them. No one is expecting that Priests be carding people at the Altar rail, or to be giving a long winded speech after the Consecration to tell the unbaptized to come up. However, if they are aware of someone attending that is not yet baptized they should not be communing them. And if at the altar rail says they never have been baptized the Priest should refrain from communing them. Beyond that our Clergy should assume likely any newcomers or visitors are baptized when they come to the Altar Rail. Note: Please note that an Earlier version of this post said that the Resolution was D051 and did not mention the proposed Task Force.